It began, as all good days should, with breakfast. 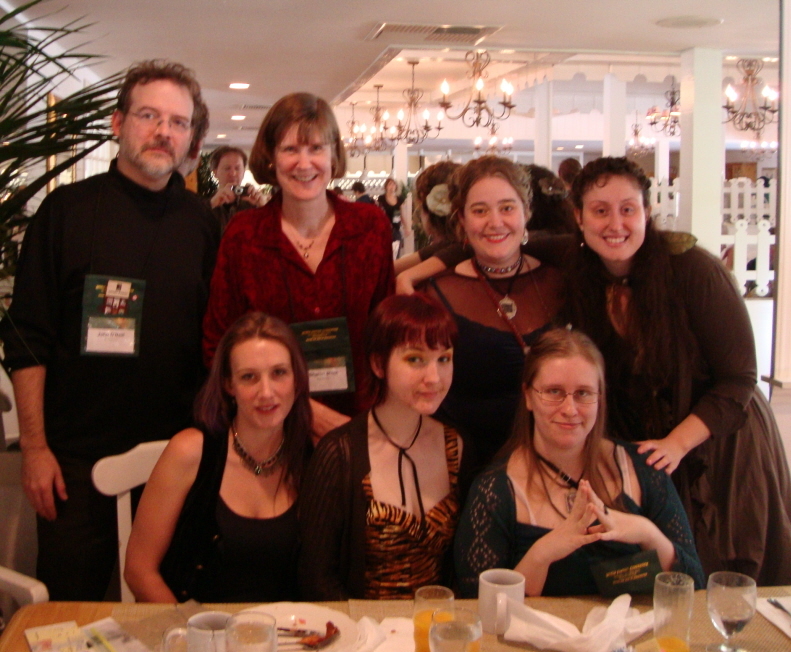 A breakfast with FRIKKIN SHARON SHINN, y’all! OH MAH GAWD SHARON SHINN! I am not going to go on about my thing for Sharon Shinn’s books. It’s just one of those things. That you have. When you think, “Ah! Look! A little novella by Sharon Shinn in this collection! How nice!” And two weeks later you emerge from rereading ALL of her books, with little black suns bursting behind your eyes and a nervous twitch, and you assure people, “No, really. I’m all right.” Anyway, for an in-depth encounter with my Sharon Shinn thing, read my review of her book, Troubled Waters. So then picture my face when she sits down next to me after fetching her breakfast buffet. We were at a large table in the corner, a big dang group of us, with O’Neill the Robot Overlord beaming benignly over the feast from the head of the table. (Or maybe it was the foot. I suppose I could have been at the head. It’s all a matter of perception. But the likelihood is that I was at the foot.) 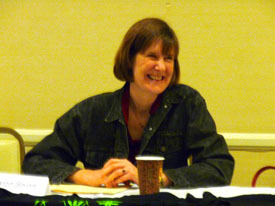 And Sharon Shinn sits down and smiles at me. “Well, yes!” I said, or something like it. And then it turned out that we both like reading the same books. “The three Mc’s,” we said, almost simultaneously — McKinley, McKillip and McCaffrey. “That explains SO MUCH!” I told her. Everyone else at the table was also beautiful and witty, I’m sure, but I was too busy being dazzled. I hardly remember who was there. Back: John, Sharon, MOI!, Caitlyn... Front: Katie, Patty, Jess (Howard, who is taking the picture, can be seen lurking in the mirror). Click for larger version. The reason you don’t remember who was there is that you stole my seat next to Sharon, sent me down to the far end of the table under the plant, and then didn’t take your eyes off her the entire time. Toward the end of breakfast, I double-dog-dared Sharon Shinn to come to the big poetry reading on Saturday night, and strongly hinted that she should maybe even submit her poetry to Goblin Fruit. (As Jess, Editrix of Goblin Fruit was sitting at our table, I felt that this was a hint with teeth in it, but what can you do?) And all in all, it was lovely. AND SO WAS HER POETRY. But I’ll get to that. That’s for Saturday. Gosh. And then the READINGS came. Of course there was Sharon Shinn at 10:30. She read from her upcoming novel The Shape of Desire, which she describes as quiet, contemporary and sort of a murder mystery. Patty and I, sitting next to each other, immediately noticed that all three of her shapeshifters were named after the Rossettis — Dante, Christina and William. (Now I can’t remember if there was a Maria. Mmn. Maybe Maria is a surprise character. WHO KNOWS?) So whatever this book is, we’ll be reading it. I mean, I’d’ve read it anyway. Patty hasn’t yet read Shinn. But she will. I saw that particular light upon her brow. 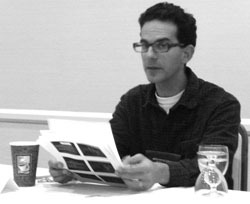 Ari Goelman had a reading next. But, oh, time passed. I had FORGOTTEN how good he was! It had been so long! And then at World Fantasy he read the most VILLAINOUSLY funny first chapter of a novel. Ysabeau Wilce's hands. HOLDING FLORA'S FURY ARC!!! Ysabeau Wilce read from Flora’s Fury. Yes. 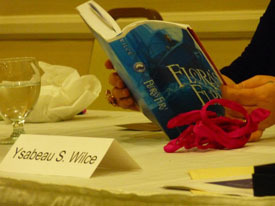 That’s the third Flora book. I must have it. I must have it or perish. She also gave us chocolates. The good kind. Thankfully, I am not the only one who puddles down into goo around Wilce’s prose (and chocolate). Caitlyn Paxson and Jessica P. Wick would both give me a run for my money, if fangirldom were a competition. Which it isn’t. I mean, OF COURSE it isn’t. Right? From 12-1, we all went gaga over Connie Willis doing her Toastmaster’s Speech. I’ve only read Doomsday Book, myself, although I am told from every interested party that I must, simply must, no really MUST read To Say Nothing of the Dog. She also made me want to watch the BBC series Primeval. She was all about Primeval. Here are some things I scrawled on the back of my program as I listened to her talk. General research (where you go to get an idea of the time you’re writing in). Specific research (where you find out what folks might have eaten for breakfast in, say, 1180 AD). From other things she mentioned, I got the impression that it is Willis herself who feels that finishing a novel is like recovering from a long illness. She intimated that it takes her quite a while to be able to even think about starting another novel without feeling sick. Anyway, she was hilarious. She is writing a story about robot who wants to be a Rockette. How cool is that? And I really MUST see Primeval. Alien Me and Alien Patty. Aliens are Blue. 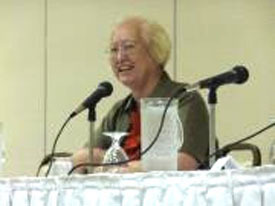 Patty Ann Templeton. Had a reading. At World Fantasy. Oh, yes, she did. She read the Lobotomy at the Orphanage scene from her novel-in-progress There is No Lovely End. She cooed. She strutted. She did voices. She played the audience and pinched our chins and was generally radiant. I have never seen her give such a great reading as that, and I have been watching her giving readings since 2004, thank you very much. After the stunning rendition of that ghost-haunted, shack-shaking, Dickens-on-crack episode, she read us from her short story “The Bee Charmer of Beckett Falls,” which I have loved in all its drafts, and which seems to be too danged interstitial to find a proper home. But I have no doubt it will. BEE CHARMERS! CARNIVALS! THE DUST BOWL! Anyway, she pretty much rocked the moon outta the sky. 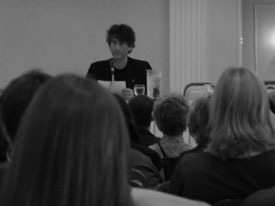 Then there was Neil Gaiman’s reading at 2:30. I dashed in a tad late, because it wasn’t in the room we all thought it was going to be in, but in another building entirely. I was going to say that we had no Daedalus or Ariadne to lead us through the Labyrinth of the Town and Country Hotel, but that’s an arrant lie. There were very friendly people placed strategically along the path, holding up signs with arrows that said “NEIL GAIMAN” and we followed those, and found our minotaur. I mean, our Neil. He was reading something beautiful and sad, about forgetting. It was about how the narrator will forget you but remember Shakespeare. How the words are leaving. How words are only the alphabet in endless codes. I did not catch the title, or where it was from. Though Neil was mic’ed, his voice was quiet, and so, for all its immensity, was the story. The room was large. The crowd absorbed the sound. I wish I had been sitting closer. Still! I was close enough for rapture, which is close enough for me. I went to see a panel called Ageless Literature at 4 PM, but I didn’t much enjoy it. The panelists were all fine — I was there specifically to see my pal Will Alexander, whose book Goblin Secrets is coming out next March — but the subject matter was a bit misty. What is a classic? What will be a classic in 100 years? What is YA? How is it different from Middle Grade? Maybe all our brains were fizzling out by then. Or maybe it was just me! Patty. After glowing all over Patrick Rothfuss. She describes herself as having "double rainbows coming out of my face." Obviously, after this, she needed a little break. There was a Black Gate meeting set for that night, but the girls and I were late getting to dinner, late finding a waitress, and very, very late being served, so we didn’t even get our food until after the meeting was well underway. Okay! So I ditched the Black Gate meeting! That was me! Am a BAD BLOG EDITRIX. Just ask anyone. On the other hand, Katie and I split a rare prime rib. So that was okay. The autograph session was from 8-11. Most of that time Caitlyn and I spent in the Neil Gaiman signing line, with folks occasionally joining us for chats or cuts. 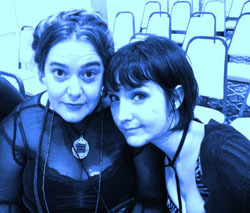 Patty had a moment with Patrick Rothfuss (adorable details in her blog), and then had to lie down. As depicted in the picture. It was a fairly sociable time and I enjoyed myself, although next time perhaps I will go and talk to all the other authors first. There were parties after this, but man, I tell ya. I was plumb tuckered. And I’m not the HARDIEST PARTY GIRL EVER. I did better on Saturday night, because I was DETERMINED to be more sociable. But that’s for Saturday night. For now, I shall leave you imagining me going to bed boring and early. But believe me, I was one of the only ones who did.